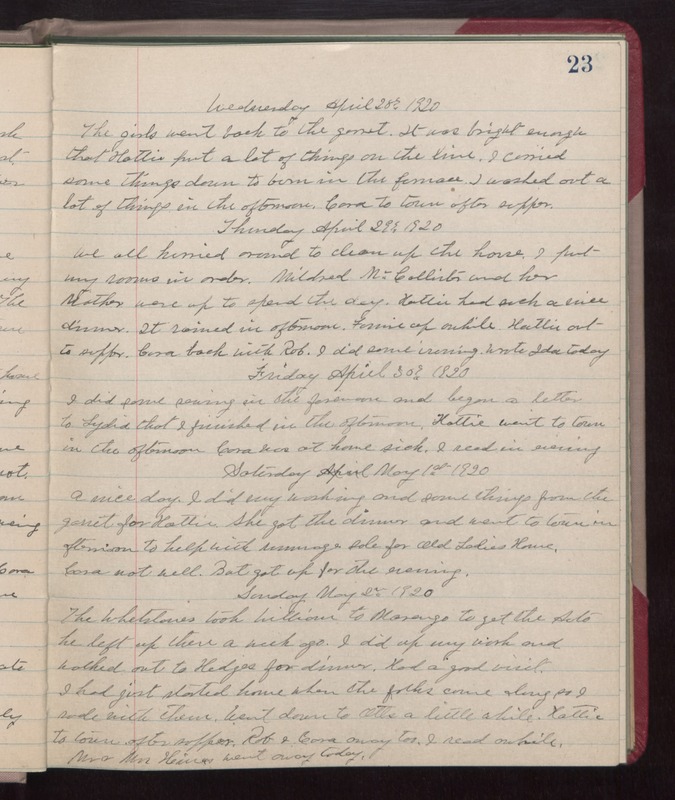 Wednesday April 28th 1920 The girls went back to the garret. It was bright enough that Hattie put a lot of things on the line. I carried some things down to burn in the furnace. I washed out a lot of things in the afternoon. Cora to town after supper. Thursday April 29th 1920 We all hurried around to clean up the house. I put my rooms in order. Mildred McCallister and her Mother were up to spend the day. Hattie had such a nice dinner. It rained in afternoon. Fannie up awhile. Hattie out to supper. Cora back with Rob. I did some ironing. Wrote Ida today. Friday April 30th 1920 I did some sewing in the forenoon and began a letter to Lydia that I finished in the afternoon. Hattie went to town in the afternoon. Cora was at home sick. I read in evening. Saturday May 1st 1920 A nice day. I did my washing and some things from the garret for Hattie. She got the dinner and went to town in afternoon to help with rummage sale for Old Ladies Home. Cora not well, but got up for the evening. Sunday May 2nd 1920 The Whetstones took William to Marengo to get the Auto he left up there a week ago. I did up my work and walked out to Hedges for dinner. Had a good visit. I had just started home when the folks came along so I rode with them. Went down to Otts a little while. Hattie to town after supper. Rob & Cora away too. I read awhile. Mr & Mrs Hines went away today.